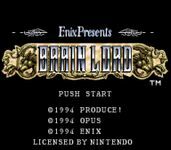 "Brain Lord is an Action RPG published by Enix for the Super NES. It was only released in Japan and the United States. Most of the game takes place in dungeons, with a heavy emphasis on puzzles. The player takes on the role of a young adventurer who can have up to two sprites, creatures that perform tasks such as healing or long range attacks, following you at one time. There are five dungeons in the game: The Tower of Light, Ancient Ruins, the Ice Castle, Droog Volcano, and Platinum. You start out in the town of Arcs; there is only one other town, Toronto (not to be confused with the real city of Toronto, Ontario). In Toronto there is a battle arena in which the player can fight for money. The player can also bet on other competitors. The game features several kinds of weapons including bows, boomerangs, swords, axes, and flails. An aspect of the game that sets it apart from RPGs such as Final Fantasy is the main character's inability to gain experience or level up. Defeated enemies yield gold, not experience points. Throughout the game the player can acquire better armor and weapons to increase his defensive and offensive capabilities, similar to the Legend of Zelda series. The sprites that accompany the protagonist could level up by picking up blue 'XP' orbs that were dropped randomly by defeated enemies. Remeer's father, the last of the dragon warriors, was sent on a quest to find the last of the dragons terrorizing the village. His father never returned. Years later Remeer sets out on his own journey to find out what happened to his father. Remeer is joined by his four friends: Kashian (a bounty hunter), Barness (a spiritual guru), Rein (a warrior), and Ferris (a witch). Each help him as he makes his way through the five dungeons in the land. Source: Wikipedia, "Brain_Lord," available under the CC-BY-SA License.